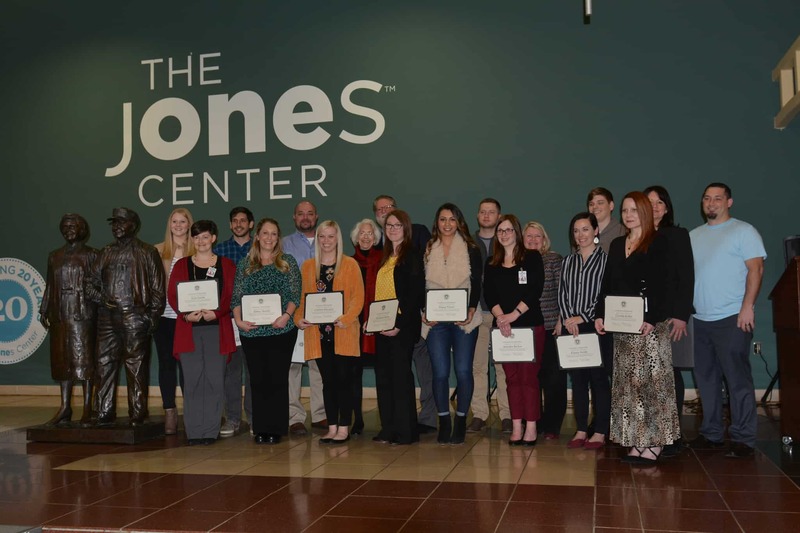 Jan. 23, 2019 | FAYETTEVILLE – Nursing students from the University of Arkansas for Medical Sciences (UAMS) recently received scholarships for the 2019 spring semester, which were made possible by the Harvey and Bernice Jones Trust for Nursing of Springdale. The 16 UAMS College of Nursing students, all of whom live and work in Northwest Arkansas, received $2,500 each. The graduate-level nursing students and their families gathered at the Concourse Stage at the Jones Center in Springdale for the scholarship presentation. Congratulating the students and presenting the scholarships were Patricia Cowen, Ph.D., R.N., dean of the College of Nursing; Pearl McElfish, Ph.D., MBA, vice chancellor of the UAMS Northwest Regional Campus; and Lauren Haggard-Duff, Ph.D., R.N., assistant professor in the College of Nursing at the Northwest Campus. Also in attendance were Lewis Epley and Dan Ferritor (an orginal trustee of the Jones Trust). Additional speakers were Betsy Phillips and Joel Carver, M.D., current trustees of the Jones Trust, who spoke about the Harvey and Bernice Jones legacy. After starting his business in 1918 with just two mules and a wagon, Harvey Jones eventually founded Jones Truck Lines, which became the largest privately owned and operated fleet in America. Throughout their lives, Harvey and Bernice Jones gave back to the entire Northwest Arkansas area, the state of Arkansas and especially the community of Springdale by generously supporting education and health care, among other regional projects.